The above info came from atomofish, and was edited by yours truly (contact me). The image came from Animated Bliss. 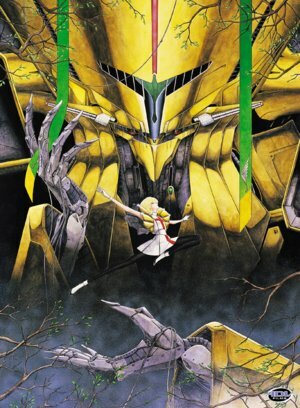 Based on the epic manga series by Mamoru Nagano, Five Star Stories takes place in the distant Joker Star System, which is separated by four star clusters (Northern, Southern, Eastern and Western). There is even a comet that serves as the fifth star and appears every 1,500 years. These stars are home to many civilizations and kingdoms. The anime focuses on an era where many battles between them are fought with giant mecha known as "Mortar Headds." Pilots, known as "Headliners" fight in these machines with the aid of online computers known as Fatimas. However, some of them have evolved to the point where they can even have human emotions. Lachesis is just one of these beings. Held under the control of the corrput ruler Grand Duke Yuuba, she is forced to fight against her will. However, she falls in love with mechanic named Ladios. But will her heart choose love, or war? The answer will forever change the face of the Joker Star System.